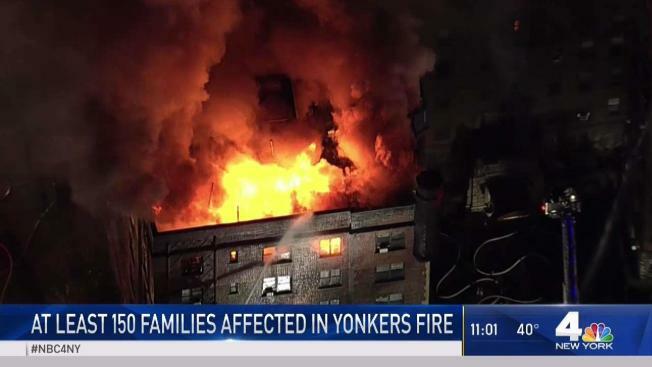 A raging blaze chewed through an apartment building in Yonkers Tuesday, destroying the building as it burned for hours, leaving dozens of families homeless and choking the neighborhood in a plume of black smoke as firefighters worked into the next day to get it under control. Katherine Creag reports. A raging blaze chewed through an apartment building in Yonkers Tuesday, destroying the building as it burned for hours, leaving dozens of families homeless and choking the neighborhood in a plume of black smoke as firefighters worked into the next day to get it under control. No injuries were reported in the blaze on Parkview Avenue that started around 6 p.m., but witnesses described the fire as an “inferno,” “thick” and eye-burning as tenants recount the uncertainty in their futures. Other neighbors could only watch and pray as the fire ripped apart the building. Another witness who lives across the courtyard from the burning building said she can't get the sight of the raging flames out of her mind. The Red Cross is helping 150 families who were left homeless in the building and neighboring buildings overcome by smoke. A temporary shelter was setup at nearby Roosevelt High School. "We are meeting one-on-one with the individuals and making sure they have the resources necessary," Abigail Adams, of the American Red Cross in Westchester County, said. Although some residents will be allowed into their apartments Wednesday afternoon to gather some of their belongings, they will not be able to stay due to safety concerns. “I saw smoke coming out of the roof and the firemen were coming,” Irene Lewis, who lives on the second floor in the burned-out building, said. “I ran into my apartment and I came to help my friend get her cats. I’ve been out on the streets ever since." It’s not yet clear what may have sparked the blaze, which appears to have started on the roof.